Sarah Rodriguez Pratt grew up in McAllen, Texas. She has a Bachelor’s degree in English from Harvard University, and a Master’s degree in Information Studies (formerly Library Science) from the University of Texas at Austin. Her first young adult book, Choose Your Weapon, was one of Kirkus Reviews‘ Best Books of the Year in 2013. She lives in Austin, Texas. 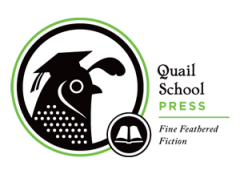 Learn more about Sarah’s books at QuailSchoolPress.com and follow her on Twitter at @QuailSchool. Copyright 2017, Quail School™ Media. All rights reserved.